Derry’s ‘Paddy Nash and the Happy Enchiladas’ are gearing up for the 2015 Danny Boy Festival in Limavady. The band will perform at the opening concert of the festival on May 15 at the Roe Valley Arts & Cultural Centre at 8pm. 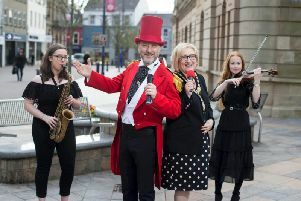 The annual festival will also include activities for children, such as the purpose built ArtCart vehicle which will be available for children to try out sound recording, digital music and photography from 1-3pm on the same day, in Drumceatt Square. Admission is free. For information on all events call 028 777 60650.